A study is underway to determine the contributing factors for surface and basement flooding in the City of Toronto and recommend solutions to improve the City’s sewer system and overland drainage routes in order to mitigate flooding problems. Study Area 43 location in the Bayview and York Mills area has experienced recurring basement and surface flooding during extreme storms in the past. 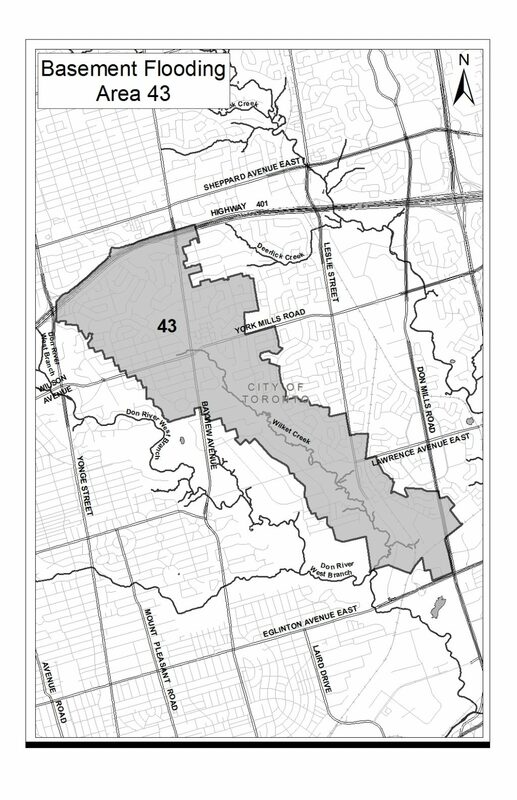 Study Area 43 is located mainly in Ward 25 and in a portion of Ward 26. It is roughly bounded by Highway 401 in the north and Wynford Drive in the south, and between Yonge Street and Don Mills Road. The Study Area is serviced by a separate storm and sanitary sewer system and has a natural watercourse Wilket Creek that flows through the study area from north to south. Join us at an upcoming drop-in event to review, discuss and provided your feedback on the preliminary solutions for reducing the risk of basement and surface flooding and improving stormwater runoff quality in the study area. Tuesday, June 12, 2018 at 6 – 8 p.m.